Sale-a-bration is almost over! Make sure to get your free stamp set or item by March 31! Today’s cards are made using the super cute ”So hoppy Together” stamp set (one of the Sale-a-bration set!) I wanted to show you how easy it is to transform one card template into 2 different cards! The first one was made for Valentine’s Day, while the second card was made for my brother-in-law’s birthday. For both cards, I used Lemon Lime Twist card stock for the card base and Granny Apple Green for the background. I used that same ink color to stamp images randomly from the set. I also added a small heart for the Valentine’s Day card in the background, from the ”Jar of Love” stamp set. For the birthday card, I colored the a waterlily with my Stampin’ Blendabilities Old Olive markers (hand drawn). For the water, I used the Pacific Blue and Bermuda Bay Watercolor crayon with the blender pen. CS and paper: Lemon Lime Twist, Granny Apple Green, Whisper White, Real Red, Basic Black. I would like to share with you the card I made for my dear husband for our anniversary. I used the Hexagon Hive Thinlits die that coordinates with the Honeycomb Hello stamp set. (Buy them together as a bundle!) 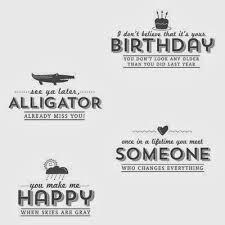 I also used the Word Bubble Framelits and Just Sayin’ stamp set. 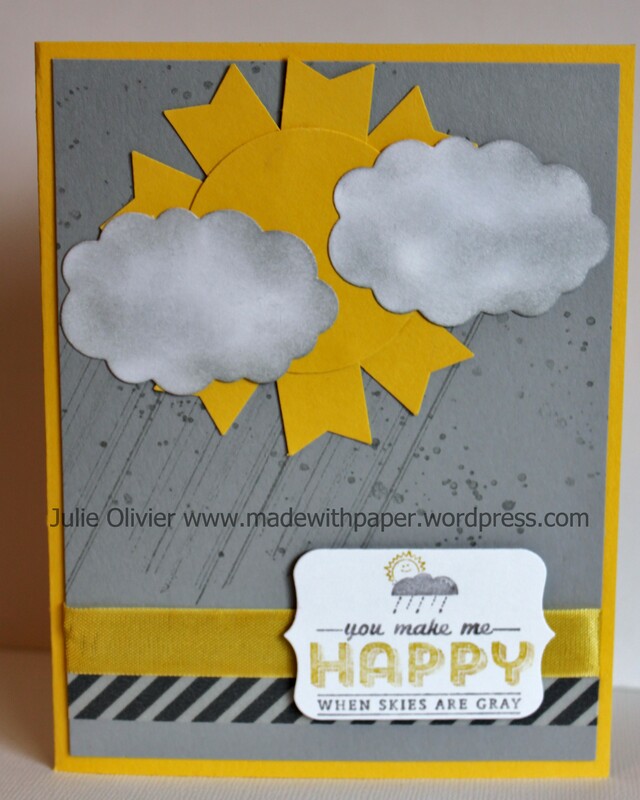 The background is Hello Honey card stock and the “hive” is Daffodil Delight card stock. 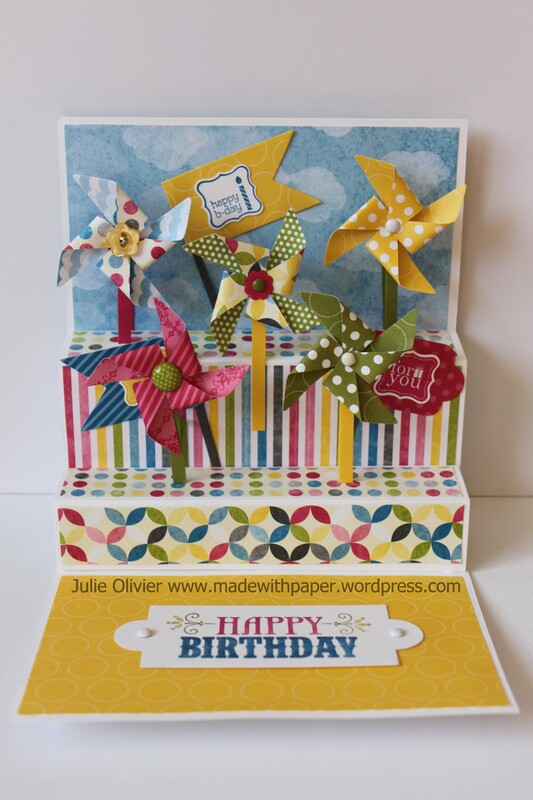 I cut small flowers in Blackberry Bliss card stock with the new Itty Bitty Accent punch. This dark purple makes a great contrast with the yellows! I like this cute little bee that goes perfectly with the hive! For this card, I combined Real Red, Basic Black and Gold, as the color scheme. I used the “Language of Love” stamp set and the banner from “Banner Blast” (a free Sale-a-bration set!). The big heart is cut with the Heart framelits out of Real Red Core’dinations card stock and embossed with the Chevron embossing folder. I then sanded the card stock to see the lighter color “appear”! The Whisper White background is embossed with the Decorative Dots embossing folder, also a free item from the Sale-a-bration. 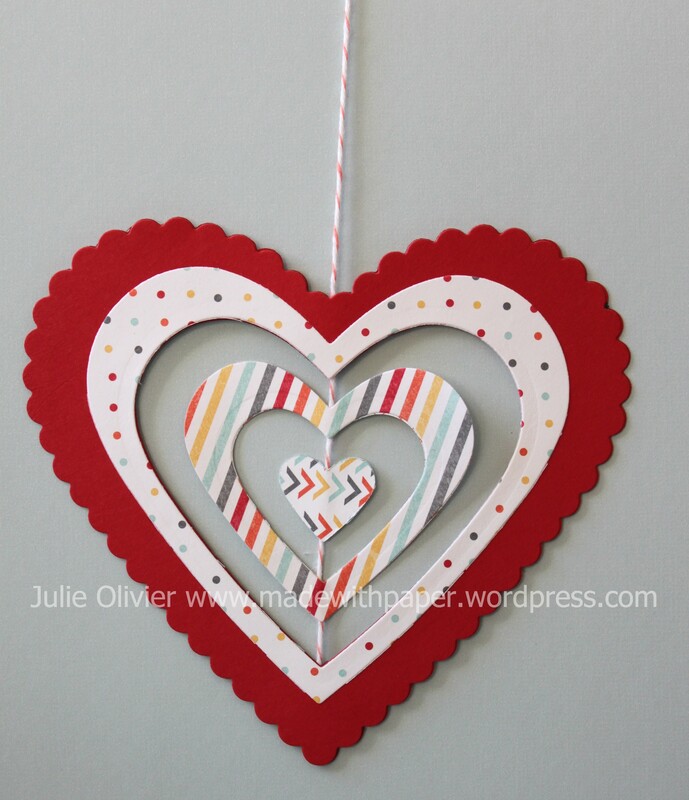 The little hearts were cut with the Owl builder punch out of Gold glimmer paper. Stamp set: Language of Love, Banner Blast. To make this Hearts mobile, I cut 2 hearts of the same size, so the Baker’s twine is like “in a sandwich” between the two layers of paper. I taped the twine with scotch tape to start, at the top and bottom of the biggest heart, just to maintain the twine in place while I glue my hearts on top of each other. What is cool is that each heart can rotate individually around. It’s quite nice if you hang it from the ceiling! Are you ready for another Christmas card made with the “Special Season” stamp set? This one is completely different than the one I posted yesterday. I stamped the Christmas tree in Crumb Cake ink on Whisper White card stock. The card stock was then cut with the Apothecary Framelits die. I sponged the edges with Crumb Cake to achieve an older look (kind of vintage, do you think?) The “Merry Christmas” was stamped in Cherry Cobbler. 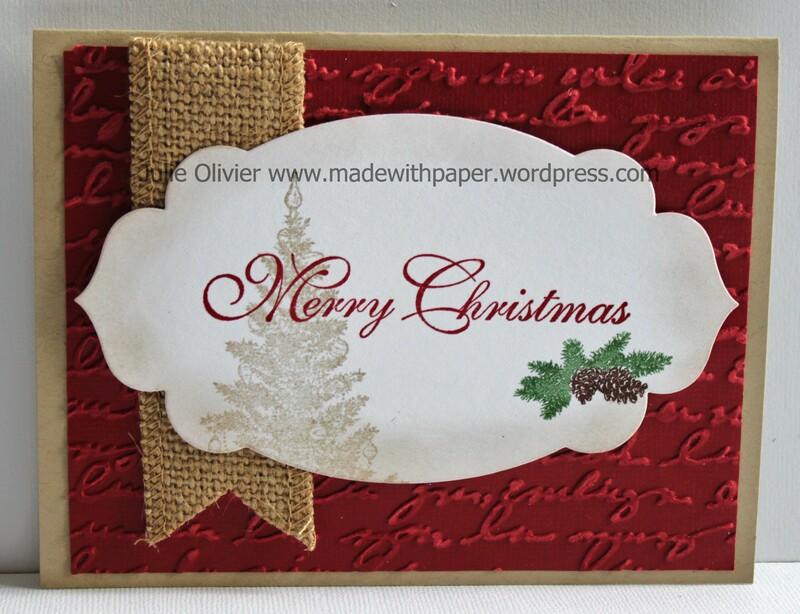 I colored the pine cones and spruce branches with the Stampin’ markers and stamped it. Ink: Crumb Cake, Cherry Cobbler, Garden Green and Chocolate Chip Stampin’ Markers. 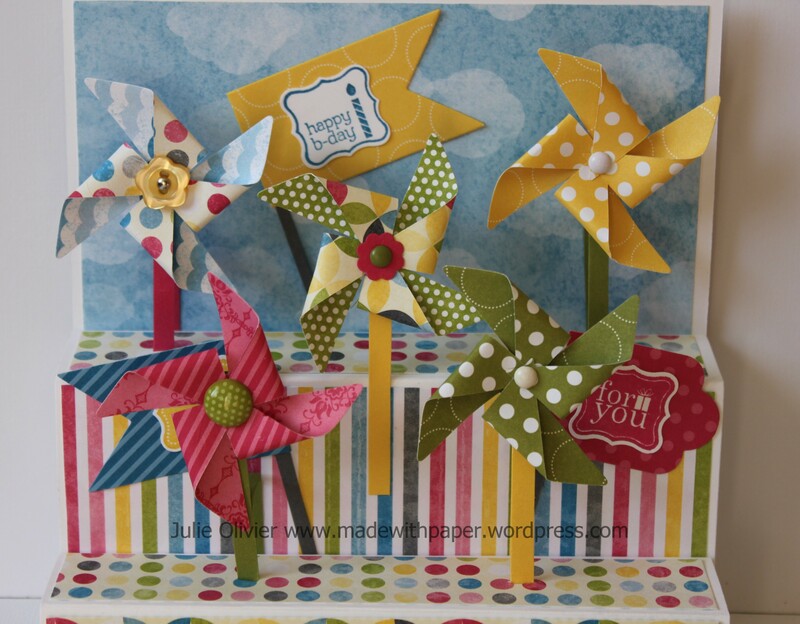 I used the Sizzlit Pinwheel die (from last year mini-catalogue) and make 6 of them. I used different buttons and brads to attach them in the center. 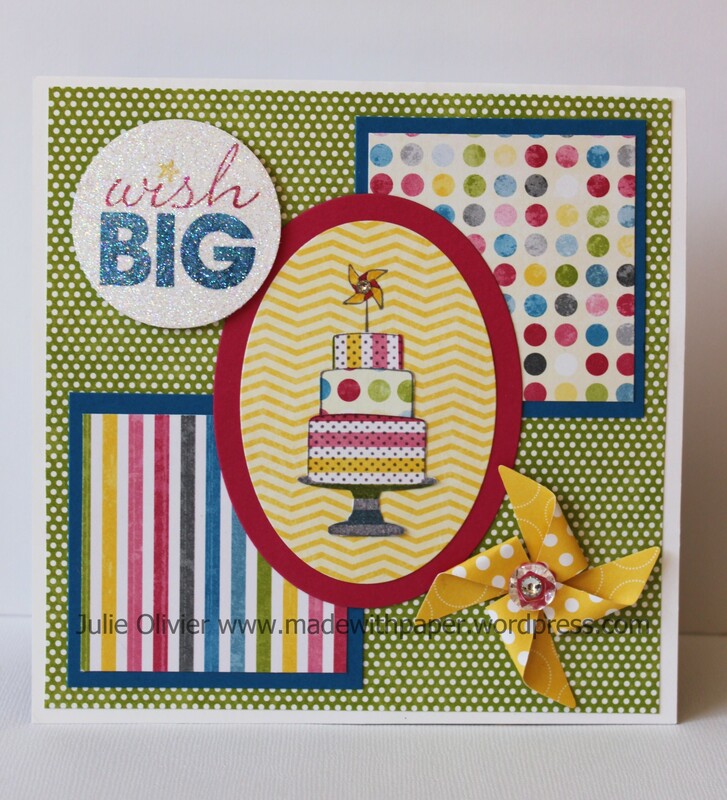 The super colorful Designer Paper ” Sunshine & Sprinkles” (now retired) inspired me this card. Here’s the inside: A real surprise when you open the card!!! Vintage Faceted Designer Button, Brights Designer button; 3/8” Designer Printed Brads; 3/16” Neutral and Brights brads, 1/8” Mini brads, Rhinestone Basic Jewels; Paper- Piercing Tool and Piercing Mat, Paper Snips, Stampin’ Trimmer, Stampin’ Dimensionals, Glue dots, Multipurpose Liquid Glue, Snail adhesive.